Cut the beef into thin slices. Put the flour on a large plate and season it. Dust the slices of beef in the seasoned flour. Heat 10g of the butter in a frying pan over a medium heat. Brown the slices of beef in batches in the butter, adding another 10g of the butter half way through if needed. Transfer the browned meat to a casserole dish or large, lidded saucepan. Add the remaining butter to the frying pan and add the onion. Fry gently until soft and golden then add to the meat in the casserole. Mix the stout or ale, sugar, tomato purée, stock and soy sauce. Pour this into the frying pan, still on the heat, and stir to deglaze the pan, ensuring all the tasty bits are scraped up. Pour over the meat in the casserole. The liquid should just cover it (if it doesn't, add a little more stock). Bring to the boil, cover and simmer for 2 hours, either on the stove over a low heat, or in an oven at 170°C, gas mark 3. 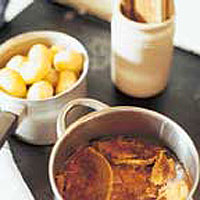 Serve with boiled potatoes. This recipe was first published in January 2005.